Rebirth is transfer of life from one physical body to another. Normally soul is supposed to be a permanent entity residing in the body of a living being that differentiates it from non-living things. When a living being dies that soul leaves the body and finds another body to be reborn as another living being. But in reality there exists no such permanent entity as soul. There is just a continuation of consciousness. Rebirth is in the form of continuous change in our body and mind. Thus we are continuously born and reborn. This concept is equally applicable to both form of rebirth that of rebirth in same life and after life. So you do not need a proof of rebirth for this chapter to be applicable to you. One of nihilism that says that there is no birth after this birth. Thus there is no future opportunity to do good or rectify our bad karma. One of fatalism where one’s future is predetermined and there is no role of our will and no way to rectify our future. Where one’ future is determined by an act of external agent. Dukkha: (discussed in chapter 2 under Four Noble Truths) is also translated as unsatisfactoriness. This unsatisfactoriness of our life is what gives rise to our Karma, which in turn is the cause for continuation of our life. Until our karma and desire for life are exhausted life continues. Anatta: is the concept of no soul or no self. As discussed earlier, there is no such thing as a permanent soul that is transferred from one body to another. Instead it is a continuation of our consciousness. This continuation of consciousness is not only on rebirth but it happens all the time for all living beings. From birth till death we are continuously changing both physically and mentally. Our thoughts, values, tastes, circumstances all change continuously. But there is a link between the changes our awareness, our memories, our link to the changing physically body and mind. This link of awareness and memories associated with life is what we call consciousness. As the link of consciousness exists from birth till death, the same continues even after death to the new body to form what we call rebirth. Anitya i.e. impermanence: We change, our relatives change, our friends change, our environment change, our situations change. They give us temporary illusion of permanence. We still consider these as permanent. We have grown up with this illusion and we even teach the same to our children. Nama and Rupa: Illusion of permanent entity or Identity is given by “nama and rupa” or Mind and Form duality. We confuse Name or Identity with form, and Form with name or Identity. Our language plays an important part in misleading us into believing that the name and form are one. While the form keeps changing we give it the same name, giving the impression of permanence. A popular analogy from “Milinda-Panha” (Questions of king Milinda) is that of a river, we call the river with the same name while the water is continuously flowing and at no moment there is same water in it to be called the same river. So is it with us, we keep on changing but still are referred by the same name. The same process occurs at the time of death and rebirth. Our body changes, our consciousness is transferred to other body, we are reborn. The process is nothing different that during we are alive. Another analogy from the same book “Milinda Panha” is that of milk – milk first transforms into curd, curd into butter and butter into ghee. Once milk transforms into curd, we do not call it milk. Similarly for butter and for ghee, we do not call it milk or curd or butter once it has transformed. Thus after rebirth we cannot call ourselves the same person we were before rebirth nor can we call ourselves a totally different person as we have the same origin. Concept of Rebirth builds on the concept of Karma that we discussed in previous chapter. The cycle of karma and its result forms the basis for the cycle of birth and death. Rebirth need not take place into human beings only. A person can be born into any of the 32 world systems depending on the gravity of the karma performed during this lifetime and previous lives. Nirvana and rebirth: There is an important relations between rebirth and nirvana. After attaining nirvana, there is no desire left, no karma left, no continuity of consciousness, body continues its journey to old age and death and there is no further rebirth. While on attaining nirvana there is no rebirth at consciousness level during the lifetime, after death even body ceases to be reborn. Rebirth and Karma are two important concepts that must be understood properly. They form an important part of right understanding or Wisdom and a strong basis for why we must maintain morality. 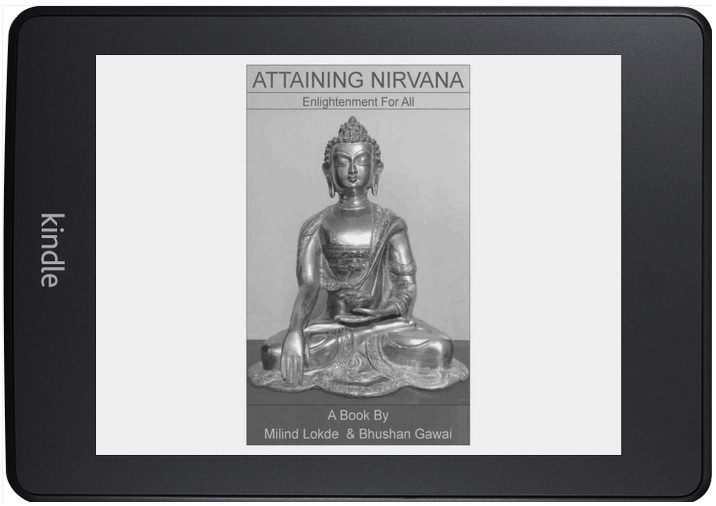 Attaining Nirvana Blog at WordPress.com.